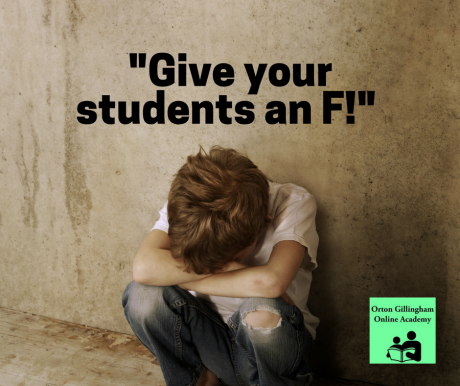 “Give your students an F!” were the words that concluded a dialogue between a general education teacher, an administrator & me. Please understand, as a special education teacher, I take it very personal if my students receive an F on a grade report. If I were giving appropriate modifications and accommodations there would be very few if any reasons for a student to receive an F. I realize there are many factors that play into that final grade, so I would like to divert off of that topic and onto a more pressing one. The general education teacher was having a real difficult time with grading her students “fairly” (there is that “fair” bomb again, but, that’s another topic for a future blog post). She said that it is not fair to give her mainstream students a B for a grade-level course and at the same time, give her student with an IEP a B, given all of the modifications/accommodations awarded this student. This teacher felt as though the grades of the mainstream student should reflect a much higher marking. Now, I realize there are no easy answers and I am not about to convey to you that I have all the resolutions that will universally be correct in every given situation, not to mention, the diversity of the student population is so vast that a quick and simple remedy is simply not feasible nor possible. Here is the kicker: (or at least one of the kickers) when I mentioned that the students with an IEP often have to put forth much more effort than the mainstream students in certain academic areas, she said with MUCH force, “THAT IS ABSOLUTELY NOT TRUE!” (Do you denote a bit of frustrations? I sure do!) She stated that her mainstream students work just as hard if not harder than the students with an IEP. Okay, let’s look at scientific research because I like to look at the facts when pleading a case. Blindly speaking gets me in trouble most of the time! Let’s look at the brain of a child with Dyslexia (or specific learning disability, which makes up a large portion of our special education populations in an inclusive setting). Given this information (and I can only imagine that those with dysgraphia, dyscalculia & any other dys you can think of would have the same degree of difficulty), how can we claim that a child who “fits inside” the conventional box works as hard or harder than those on the “outside, clawing to get in?” Remember, these are my conclusions & you will have to draw your own. …are working tirelessly despite insurmountable obstacles an F? …are suffering the wrath & ridicule of other students for being different an F? …are running a marathon (with hurdles) instead of a sprint an F? …are working hours into the evenings on required school work, leaving the parent and child tired and irritable an F? I would like to conclude by saying that I have worked for some of the best administrators on the planet & this was one isolated incident that has remained with me since. I will never forget what those words did to me nor do I want to. The drive and passion in me to walk beside, run with or carry if need be, each of my students to optimal success is the fuel that not only inspires me to rise in the morning, but ignites under my rear-end to remind me to never give up this higher calling I have been given for the sake of the children. Have you ever had one of those, “Give your students an F!” moments that gives you even more vim and vigor as you strive to be the very best person holistically? Hang on to those moments, not to hold onto bitternesses (I am not bitter toward this administrator. She’s growing and learning along the continuum of life just like I am), but to use them to change you for the better. I’ve heard a phrase floating around the academic world that we have this one moment to make a positive difference in the life of a child. For me, it isn’t going to be by giving that precious one an F! Keep doing what you are doing because the world needs what only YOU have to offer!